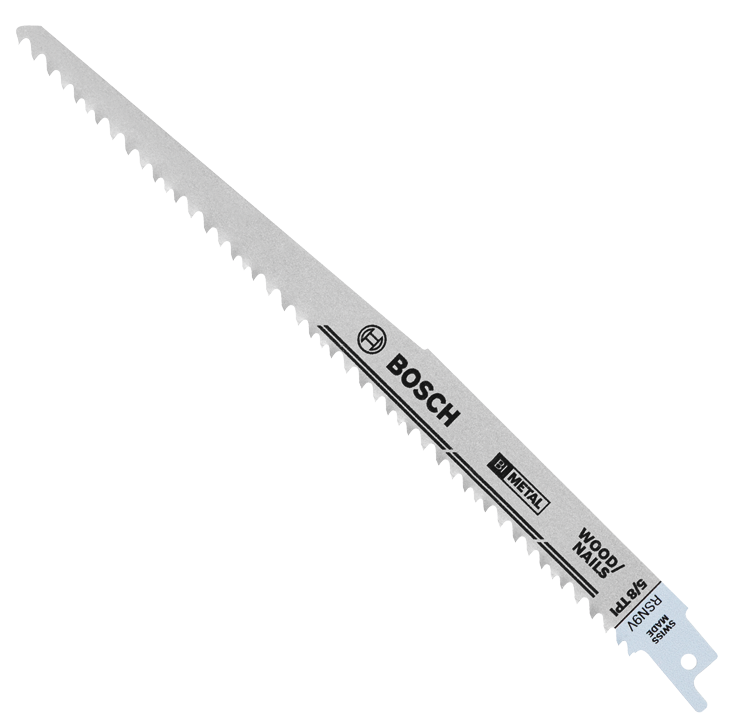 Bosch Wood with Nails Reciprocating Saw Blades feature superior bi-metal construction, delivering maximum life and durability in heavy use. These blades are optimized for cutting speed and efficiency. The recip blades have a reinforced 5/8 variable-pitch tooth design to handle tough wood with nails applications. The blades feature taper backs and plunge tips for easier starts, and thick 0.05 In. bodies for straight cuts with less vibration. Wood with nails cutting blades are available in 6 In. and 9 In. lengths. With variable gullet depth, the varied space between each tooth collects and clears material faster. By incorporating high-quality materials, best manufacturing processes and proven tooth-design features, Bosch provides professional reciprocating saw blades that cut faster and last longer.